In recognition that every project is unique, Excel Switchgear offers a full design, engineering, electronic drafting (ACAD) and manufacturing service. 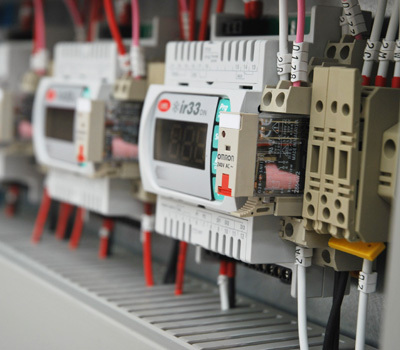 In consultation with the customer, we produce high quality, low voltage electrical switchboards, suitable for industrial and commercial buildings. We have a range of enclosure options for installations up to 630A including our own Excel Modular Metalwork, NHP Modular Enclosures and Schneider Prisma G system. For installations above to 630A and up to 4000Amps we prefer to use the Schneider Prisma P System, which is type tested, safe and adaptable. As technology has evolved, the smart home is now a reality. We have designed and manufactured switchboards and control panels for a number of fully automated homes, incorporating full energy management, lighting, sound, appliance and HVAC control, as well as security systems. We have a range of enclosure options available to meet the specifications of the installation of electrical switchgear. Our boards can be painted to match the house interior design. 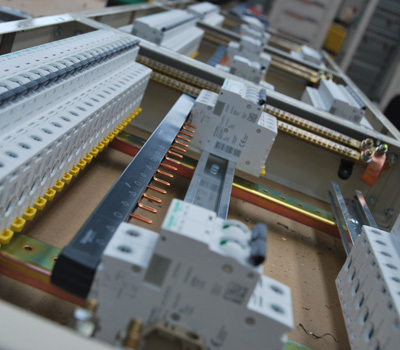 Many larger projects require multiple distribution boards to feed different levels or areas of the facility, each one designed to specification. Our team are efficient and cost effective in the manufacture of these boards. The replacement of obsolete distribution boards or the addition of new capacity is also a common source of demand for our distribution boards. 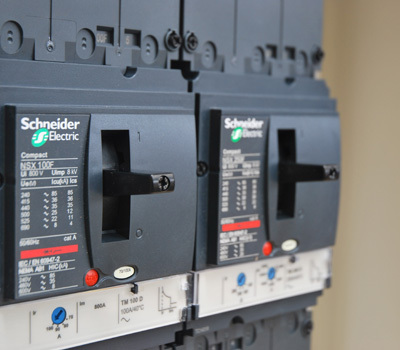 We have a range of enclosure options available to meet the specifications of the installation of electrical switchgear, depending on the required IP Rating and whether the board is to be floor or wall mounted. With stock on hand, we can offer a fast turnaround of smaller boards should the situation arise. Energy efficiency is a common objective, particularly in large commercial or industrial sites where the Power Factor may be poor. We can recommend and supply the appropriate PFCU to suit the site in question and optimise the energy efficiency. In some cases boards are required to be housed outdoors, for example at sports grounds, and are therefore required to be weatherproof. In these cases we offer Stainless Steel enclosures, Aluminium Pillar Boxes or polyester cabinets.